Swiss Post is aiming to improve its CO2 efficiency by at least 10 percent by the end of 2016. 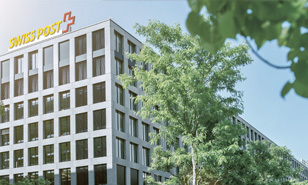 In 2015, Swiss Post moved into its new headquarters. The MINERGIE®-compliant building was awarded the international DGNB certificate in gold. Green electricity, hydrogen, biodiesel and biogas are increasingly used as fuel for Swiss Post's vehicle fleet. In its procurement of work clothing, Swiss Post adheres to high social, ethical and environmental standards. With its dual focus on climate protection and energy, Swiss Post has continued to successfully implement its 2014–2016 sustainability strategy in the past year. It aims to increase CO2 efficiency by at least 10 percent by the end of 2016. The MINERGIE®-compliant building in the WankdorfCity district of Berne is the first office building in Switzerland to receive the DGNB certificate in gold. It meets the most stringent sustainability requirements. 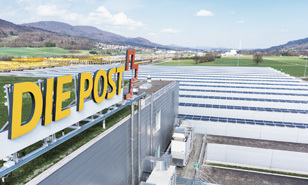 Swiss Post has been increasing the share of renewable energy for years now, covering its electricity requirements with renewable energy from Switzerland. The company's ten photovoltaic systems feed around 8,700,000 kilowatt hours of solar electricity into the grid every year. Across all roles at Swiss Post, around 240,000 items of work clothing were worn by 37,000 employees in 2015. 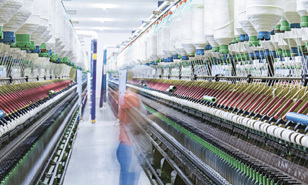 77 items are currently manufactured at 23 production facilities in 12 different countries. Under steadily improving working conditions. Whether it's the postal carrier's raincoat, the PostBus driver's trousers or the logistics technician's pullover: with approximately 20 tonnes or 60,000 items of clothing collected, employees turned the campaign “A second lease of life for Swiss Post clothes”, launched in 2015, into a big success in just a few months. PostEurop acknowledged this commitment in 2015 with the “Coup de Cœur” award. 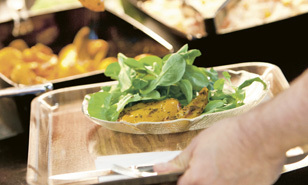 For Swiss Post, sustainable, balanced and fair catering for staff is important: seasonal, regional and vegetarian food is on the menu. Only Fairtrade coffee is served. Carbon neutral at no extra charge for the customer: since 2012, Swiss Post has been sending all domestic letters carbon neutrally. In 2015, in collaboration with Genossenschaft Ökostrom Schweiz, Swiss Post funded the development of the first gold standard Swiss Post climate protection project in Switzerland for this “pro clima”–Shipment service. Modern biogas plants on Swiss farms collect methane, a greenhouse gas produced by the storage of liquid manure and dung, and use it to generate heat and electricity – thus turning methane, which is harmful to the climate, into a clean energy source for eco-electricity. In 2015, Swiss Post again supported numerous foundations and charitable organizations. It contributed to the success of the 2 × Christmas campaign by transporting more than 72,000 gift parcels free of charge to the Swiss Red Cross logistics center. From the end of January, the donated parcels were distributed to individuals and families in need in Switzerland and Eastern Europe and to social institutions. of CO2 emissions were generated by Swiss Post in 2015.
is the CO2 efficiency improvement over 2010 achieved by Swiss Post by the end of 2015.
is the number of times the “pro clima” – Shipment service was used for letters, parcels and other services. of all Swiss Post vehicles use alternative drive technologies. of electricity requirements are covered with “naturemade basic” certified renewable energy from Switzerland. parcels were shipped free of charge by Swiss Post as part of the 2 × Christmas campaign.